This artist's view shows Pluto center, and its large moon Charon, as well as two of its four smaller moons (at top left and right). Pluto's four tiny moons are Nix, Hydra, Kerberos and Styx. Pluto should still be a planet — at least according to a recent and decidedly unofficial popular vote. But the IAU's definition and Pluto's planet status change remain controversial, among astronomers and laypeople alike. So the Harvard-Smithsonian Center for Astrophysics (CfA) revisited the topic last week, bringing in three experts to debate Pluto's status in a webcast event called "What Is a Planet?" On Sept. 18, 2014, the Harvard-Smithsonian Center for Astrophysics held an unofficial popular vote on the definition of a planet during an Observatory Night talk in Cambridge, Massachusetts. Gareth Williams, associate director of the Minor Planet Center in Cambridge, Massachusetts, supported the IAU's 2006 definition. But his two fellow presenters pushed for different definitions, both of which would restore Pluto's planethood. Harvard science historian Owen Gingerich, who chaired the IAU's planet-definition committee, asserted that "a planet is a culturally defined word that changes over time." 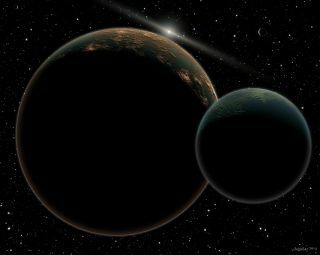 And the CfA's Dimitar Sasselov, director of the Harvard Origins of Life Initiative, declared that a planet is "the smallest spherical lump of matter that formed around stars or stellar remnants." After Williams, Gingerich and Sasselov made their cases, debate moderator David Aguilar of the CfA asked audience members — those present in person, not watching online — to choose their preferred definition. Sasselov's won in a landslide. Interestingly, the IAU's definition applies only to bodies within our own solar system. Sasselov's is more inclusive, taking into account planets orbiting other stars. Astronomers have discovered nearly 2,000 such exoplanets and believe many billions are scattered across the galaxy; indeed, every star in the Milky Way likely hosts at least one planet on average, researchers say. The world will soon get its first close-up look at Pluto, however the faraway world is defined. NASA's New Horizons mission is scheduled to fly by the Pluto system in July 2015, gathering a wealth of data on an object that has remained mysterious since its 1930 discovery.